Dear Friends and Colleagues - I have the honor to send this invitation to you regarding the official Washington, D.C. launch of my first book which will be hosted by the Smithsonian National Museum of African Art (NMAA) on February 10, 2015, 6:30pm - 8:30pm. The book launch is also being featured as a Black History Month activity and there will be a "conversation segment," with Dr. Johnnetta on the role of women of color in preserving cultural practices. I hope you can attend and also share the announcement within your organizations - Sincerely, Ambassador Robin Renee Sanders. You can rsvp below by clicking on the embedded link in the announcement. Join us to celebrate Black History Month and the official launch of The Legendary Uli Women of Nigeria. 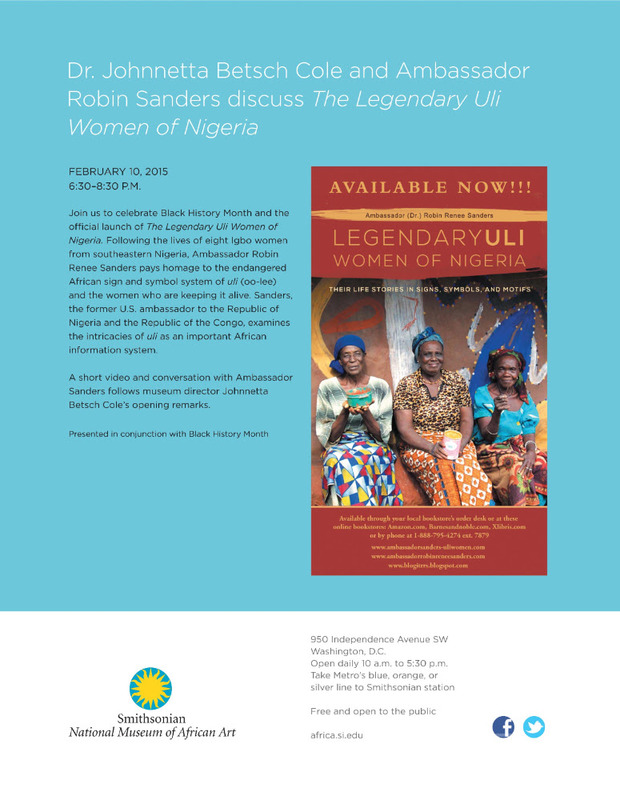 Following the lives of eight Igbo women from southeastern Nigeria, Ambassador Robin Renee Sanders (Amb. Sanders Bio) pays homage to the endangered African sign and symbol system of uli (oo-lee) and the women who are keeping it alive. Sanders, the former U.S. ambassador to the Republic of Nigeria and the Republic of the Congo, examines the intricacies of uli as an important African information system. A short video and conversation with Ambassador Sanders follows museum director Johnnetta Betsch Cole’s opening remarks. Kindly RSVP using this Eventbrite invitation link. 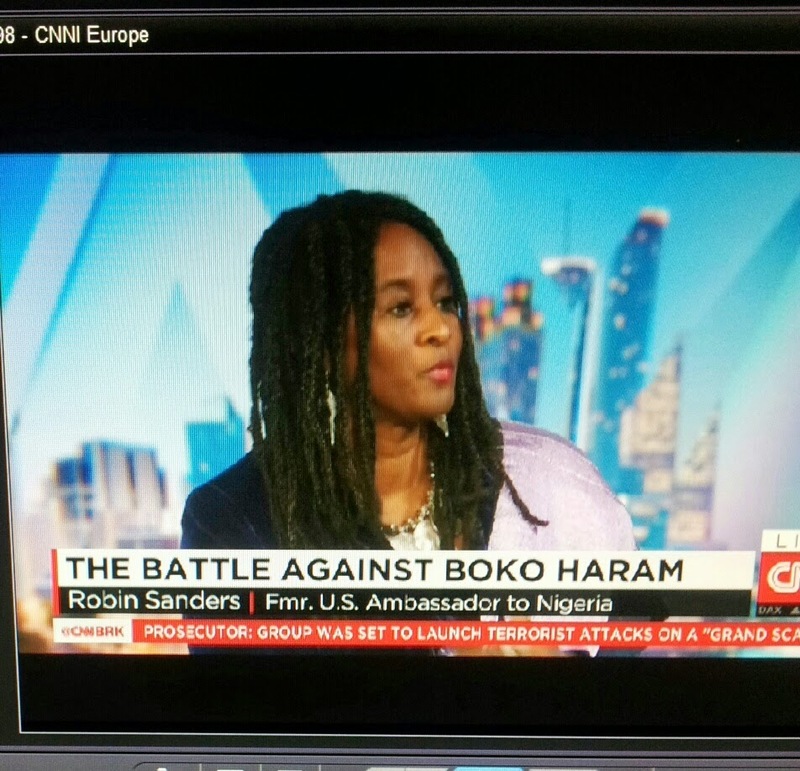 On January 15, 2015, Ambassador Sanders discussed the lack of attention to the raging crisis in Northeastern Nigeria with the recent attacks in Baga affecting at least 20,000 people fleeing to the neighboring countries of Niger and Cameroon. Reports on the numbers of those massacre remain sketchy with figures ranging from 500-2,000. Baga has been torched to the ground as Boko Haram continues in ISIL-like fashion to gain wide swaths of territory in the Northeast. Sanders discussed this on CNN International CNN "Today Show."